There's a lot 'expert' advice about the best times to eat your meals. But how much does it matter if you never eat breakfast, or if you like to eat your dinner at 9 o'clock every night? Timing your meals can also be tricky if you work unsociable hours, as your body clock will be out of sync with your metabolism. Nutritionists always talk about how breakfast is the most important meal of the day, but many people just don't like eating first thing in the morning. Breakfast does kick-start your metabolism but don't panic about your body going into starvation mode just because you don't eat your breakfast immediately on getting up - what about those days when you are lucky enough to have a lie in! 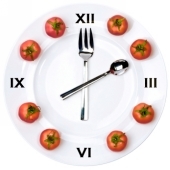 You may find that eating too much early in the day makes you hungrier than ever before lunch. Try just having a portion of fruit first thing, and then cereal or toast at about 10 o'clock to stave off the mid-morning munchies. Alternatively, swapping your breakfast to something protein based, like a boiled egg or go for higher fibre, slower releasing carbs such as porridge, All Bran or baked beans to help keep you fuller for longer. Lunch can be as large or as small a meal as you want it to be - so long as you then adjust the size of your evening meal to complement it! Many Nutracheck users tend to make lunch a small meal, and save most of their calories for the evening - making sure they don't run out of calories early in the day! Your metabolism slows down towards the end of the day, so it is better to eat your evening meal before 8 o'clock if possible. It can also be harder to sleep if you're trying to digest a huge meal! However, if you always end up eating late because of work or partner commitments don't worry too much. Just try to limit the amount of carbs in your evening meal and make up for it with plenty of fibre and protein. That way you won't be left feeling too bloated in the morning. Eating little and often is better for you than eating three huge meals a day - your metabolism will find it easier to digest small regular amounts of food. Snacking also means you're less likely to overeat when you do have a meal, so try to keep a constant supply of fruit or cereal bars with you to stave off hunger throughout the day.